The execution of Robespierre. 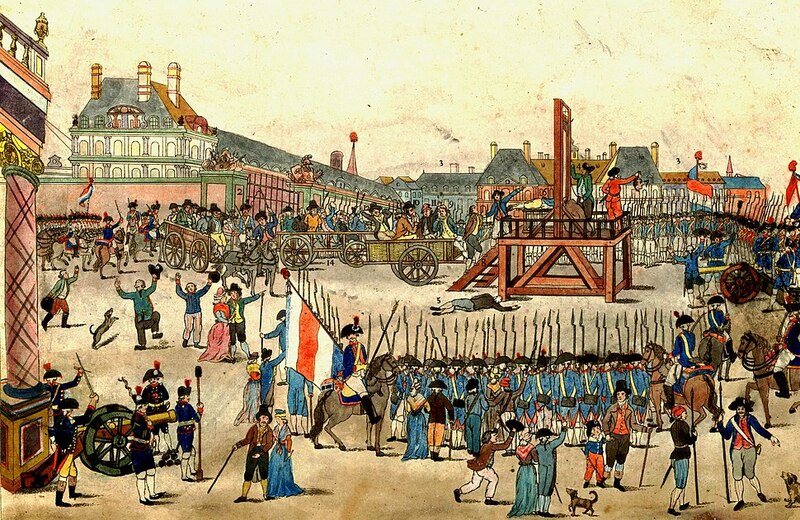 Note: the beheaded man is not Robespierre, but Couthon: Robespierre is shown sitting on the cart closest to the scaffold, holding a handkerchief to his mouth. To raise money, Southey and Coleridge began to work together in August 1794. According to Southey the project began in "sportive conversation" at the house of their friend Robert Lovell. The three intended to collaborate on a play that would deal with the beheading of Robespierre in July 1794. Their source was news articles that described the final moments of a dispute within the National Assembly. During composition, they were able to write 800 lines in just two days. The play was divided between the three collaborators, with Coleridge composing the first act, Southey composing the second act and Lovell the third. Southey and Lovell completed their acts but Coleridge had only finished part of his the following evening. Southey felt that Lowell's contribution was not "in keeping" and so rewrote the third act himself. Coleridge completed his act. When they turned to Joseph Cottle to publish the work, he refused and Coleridge had to search for another publisher. He took the manuscript to Cambridge, revising and improving his own contribution. Eventually, the work was published in October 1794 by Benjamin Flower. Five hundred copies were printed and circulated in Bath, Cambridge, and London, which brought the writers fame while their personal relationship grew tense. The events that inspired the work involve Robespierre's taking over of the National Assembly and removing the moderate members. During this time, he also allowed the executions of many individuals and became the center of power during the summer of 1793. The next summer, 28 July 1794, he was executed by guillotine along with 21 others. The play is filled with various speeches on the topic of liberty. The first scene is set in the Tuileries, in which Bertrand Barère, Jean-Lambert Tallien and Louis Legendre, opponents of Robespierre discuss their plans to challenge the "tyrant". Their conversation comprises highly rhetorical speeches as if they were part of a public meeting. All sacrificed to liberty's wild riot. The third act, originally written by Lovell, was rewritten by Southey. Within the act, the opponents of Robespierre compare themselves to the assassins of Julius Caesar who are restoring the republic. In the final speech, Bertrand Barère discusses the history French Revolution and lists the various would-be despots who have attempted to usurp liberty for Louis XVI to Robespierre himself, concluding that France will be a beacon of liberation to the world. The despot's pride, and liberate the world. Act one reflects Coleridge's feelings about those Robespierre executed, including Madame Roland and Brissot. The tone of the piece is not revolutionary, but it does include themes connected to his other works and reveals Coleridge's thoughts on marriage, politics, and childhood. It also incorporates Coleridge's view that individuals are naturally innocent in a manner similar to Rousseau's belief. This idea, combined with a belief in achieving some sort of paradise, was developed in the works following the play. The play as a whole deals with many Shakespearean themes and emphasises the precedents of both Brutus and Mark Antony throughout. Southey's third act captures his feelings on the French Revolution and incorporates his radical views. The act also contains his feelings on despotism and liberty. An anonymous review in the November 1794 Critical Review argued that the subject matter would have been appropriate for a tragedy but the events happened too soon to allow for it to be dealt with in an appropriate manner. The reviewer also commented on the haste of the work and that it "must, therefore, not be supposed to smell very strongly of the lamp. However, the review does praise aspects of the poem, as the author writes, "By these free remarks, we mean not to under-rate Mr. Coleridge's historical drama. It affords ample testimony, that the writer is a genuine votary of the Muse, and several parts of it will afford much pleasure to those who can relish the beauties of poetry. Indeed a writer who could produce so much beauty in so little time, must possess powers that are capable of raising him to a distinguished place among the English poets." In the British Critic, an anonymous reviewer argued in 1795 that "The sentiments ... in many instances are naturally, though boldly conceived, and expressed in language, which gives us reason to think the Author might, after some probation, become no unsuccessful wooer of the tragic muse." Holmes, Richard. Coleridge. New York: Pantheon Books, 1989. Madden, Lionel (ed). Robert Southey: The Critical Heritage. London: Routledge and Keegan Paul, 1972. Speck, W. A. Robert Southey. New Haven: Yale University Press, 2006. This article presents lists of the literary events and publications in 1794. Antoine Christophe Merlin (13 September 1762 in Thionville, Moselle – September 1833 in Paris) was a member of several legislative bodies during the era of the French Revolution. He is usually called Merlin de Thionville (Merlin of Thionville) to distinguish him from Philippe-Antoine Merlin de Douai. Antoine Trial (13 October 1737, Avignon – 5 February 1795, Paris) was a French singer and actor. He was the younger brother of the musician Jean-Claude Trial (1732–1771) and husband of soprano Marie-Jeanne Milon, stage name Félicité Mandeville (1746–1818). After an education at the cathedral in Avignon, he followed his older brother to Paris in 1764 and joined the troupe of the Prince of Conti. On 4 July the same year, he made his debut at the Comédie-Italienne as Bastien in Le Sorcier by Philidor. On 12 December he sang the second tenor (a comic role) at Versailles in the court revival of Mondonville's Daphnis et Alcimadure, alongside the former stars of the Académie Royale de Musique, Marie Fel and Pierre Jelyotte.Although considered an excellent actor and musician, his haute-contre voice was thin and nasal, and he specialised in the roles of peasants and servants. His roles included Bertrand in Le déserteur, Ali in Zémire et Azor and André in L’épreuve villageoise. Trial became a French term for a tenor with a thin, nasal voice, examples being in the operas of Ravel and in The Tales of Hoffmann. He sided with Robespierre in 1793 and became active in the Terror. After the fall of Robespierre he was forced to abandon the theatre and poisoned himself. Charles Cochon Lapparent (24 January 1750 in Champdeniers-Saint-Denis – 17 July 1825 in Poitiers) was a French politician and Minister of Police. He was born into a bourgeois family that was formerly Protestant, a religion they were required to recant. Lapparent was elected deputy of the Third Estate, and he held important functions in the National Convention, in the armies of the Republic and the committee of public health. On 9 Thermidor, he participated in the fall of Robespierre. During a meeting of the French Directory he was appointed minister of police. However, he was accused of being royalist and deported. During the time of the Consulate and the First French Empire, he held important posts, but in 1815 he was forced to leave France, being allowed to return to Poitiers after a year of exile. Jean-Baptiste Mailhe (2 June 1750, Guizerix - 1 June 1834, Paris) was a politician during the French Revolution. He gave his name to ""the Mailhe amendment", which sought to delay the execution of Louis XVI. Joseph-François-Nicolas Dusaulchoy de Bergemont (21 February 1760 – 25 July 1835) was a French playwright, writer and journalist. Dusaulchoy first spent some time in Holland, where he cooperated with the editorial board of the Gazette d’Amsterdam. Back in France, he embraced with enthusiasm the principles of the French Revolution and wrote successively for the Courrier national, le Républicain, for Les Révolutions de France et de Brabant from July to December 1791 following the departure of Camille Desmoulins, for the Semaine politique et littéraire during the first trimester of 1792, then, under the 1st Républic, for le Batave or le Sans-culotte. Jailed during the Reign of Terror, he was released after the Fall of Robespierre and towards the end of 1796, entered the offices of the police ministry where he was responsible for monitoring newspapers. After he was no longer in that position, he was attached to the direction of the Journal des arts, des sciences et de la littérature, then to that of the Courrier de l’Europe, which later was incorporated into the Journal de Paris. Joseph Boze (7 February 1746 – 25 January 1826) was a French portrait and miniature painter born at Les Martigues (Bouches-du-Rhône). He painted the portraits of Louis XVI and Marie Antoinette, and, being devoted to the court and the royal family, narrowly escaped the guillotine. He was thrown into prison, but the fall of Robespierre set him at liberty, and he came to England, where he remained until the restoration. He died in Paris in 1826. His own portrait is among his drawings in the Louvre. Laurent Lecointre was a French politician, born at Versailles on 1 February 1742, and died at Guignes, Seine-et-Marne on 4 August 1805. He is also known under the name of "Lecointre de Versailles". Unlike almost all his colleagues of the National Convention, Laurent Lecointre was not a lawyer by training, but a merchant of canvases. In 1789, he was second in command ("lieutenant-colonel) of the National Guard of Versailles under the orders of Charles Henri Hector d'Estaing. It was Lecointre, who evacuated the chateau de Versailles, and regulated the crowd on the 6th of October 1789, the day of the Women's March on Versailles. He was a important member of "La Société des amis de la Constitution" de Versailles. On September 15, 1792, he proposed that the dauphin and his sister were separated from their parents. He became the first witness at the trial of Marie-Antoinette in October 1793. Lecointre denounced the crazy nights in the Grand Trianon, and the luxury of the court. It was Lecointre, who lead Robespierre to the carpenter Maurice Duplay, on 17 July 1791, after the Champ de Mars Massacre. After the defection of Dumouriez in April 1793, Count Louis-Auguste Juvénal des Ursins d'Harville became suspect and was arrested at the request of Lecointre. The day of the ceremony of the Cult of the Supreme Being on 8 June 1794, he and Barras called Maximilien de Robespierre a tyrant and feared for their lives on 9 Thermidor. According to Lecointre the Law of 22 Prairial was written by Robespierre and not by Couthon. Lecointre, the instigator of the coup, that led to the Fall of Robespierre, contacted Robert Lindet on the 6th, and Vadier on the 7th Thermidor. The other members were: Fréron, Barras, Tallien, Courtois, Thuriot, Rovère, Garnier de l’Aube and Guffroy (Fouché was not involved). They decided that Hanriot, Dumas and the family Duplay had to be arrested first, so Robespierre would be without support, but things went differently. In april 1795 he was involved in the Insurrection of 12 Germinal, Year III. The Assembly immediately voted the deportation of Collot, Billaud, and Barere to Guiana. Eight prominent Montagnards were arrested including Amar, Leonard Bourdon, Cambon, René Levasseur, Maignet, Lecointre and Thuriot. It was an indication of the extent to which the Assembly was now bent on undoing the past.He benefited from the general amnesty general voted during the separation of the national Convention on the 26th of October 1795. Laurent Lecointre, then adheres to the ideas of Gracchus Babeuf, but denies any link with him?Under the French Consulate Lecointre was the only one who voted against the Constitution of the Year VIII (1799), which established three consuls for life? He was exiled to Guignes, where he owned a property, and ended his days. Robert Southey ( or ; 12 August 1774 – 21 March 1843) was an English poet of the Romantic school, one of the Lake Poets along with William Wordsworth and Samuel Taylor Coleridge, and England's Poet Laureate for 30 years from 1813 until his death in 1843. Although his fame has been eclipsed by that of Wordsworth and Coleridge, his verse still enjoys some popularity. Sophia Kingdom, Lady Brunel (c. 1775 – 1855) was the daughter of William Kingdom, a contracting agent for the Royal Navy, and the army. She was born in Plymouth, England. She was the youngest of sixteen children. When she was eight years old, her father William died (1783). Sophia was sent to France to improve her knowledge of the language. While working there as a governess she met Marc Isambard Brunel (1769–1849) at Rouen in the early 1790s. In 1793, Brunel had to flee the revolution, going to the United States, but Sophia remained in Rouen. During the Reign of Terror, she was arrested as an English spy, and daily expected to be executed. She was only saved by the fall of Robespierre in June 1794. In April 1795 Sophia was able to leave France and travel to London.Brunel remained in the United States for six years, sailing for England in February 1799. He immediately searched for and found Sophia in London. They married on 1 November 1799. They had two daughters, Sophia and Emma, followed by a son, Isambard Kingdom Brunel, born on 9 April 1806. Isambard was one of the greatest engineers of the 19th century.Sophia's sister, Elizabeth Kingdom (1761–1856), married Thomas (1760–1843) the namesake son of Thomas Mudge, the horologist.